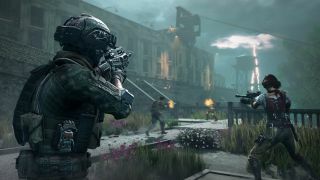 The game has been out for over six months, but players can finally jump into a new Blackout arena. Our Black Ops 4 Blackout Alcatraz map guide has the entire island covered from top to bottom, looking at the best places to drop around the prison. Alcatraz is a much smaller area than the usual Black Ops 4 Blackout map, and it plays much differently to a normal Black Ops 4 Blackout game because you have a limited number of respawns - provided one of your teammates is still alive. Read on for our complete guide to the new Black Ops 4 Blackout Alcatraz map. Starting at the top of the island, Model Industries is a great place to drop when you're still learning how to play the new mode. It's pretty much impossible to have an isolated drop unless you get incredibly lucky, but since it's so close to the edge, it's unlikely you'll have to contest many people. There's quite a lot of loot too, since the building has three floors and a rooftop, and each one is littered with items. From here, you can either move across to Powerhouse or down to New Industries. Along the topside of the island are two named locations; Officer's Club and Docks. Officer's Club is a single long building with not too much loot, and while Docks is better, it's much more popular. However, if you land between the two, you get a number of buildings with a lot of verticality and floors, and you have the option of either moving up or down afterwards. This one's for the ultra campers, the players who don't feel confident in a 1v1 fight. Right at the southern edge of the map is a small island with a single hut on it. The only loot here is an Essex Model 07 on the wall, but if you feel like you've got no option but to hide your way to victory, this is one of the best spots in the game for that. Our final recommended spot to land in on the Blackout Alcatraz map is on the rooftop of Cellhouse. It's right in the middle of the map so you'd think it's a hotspot, but most people actually tend to fly to the bottom of the building - in our experience, anyway. There's not a lot of loot up there, but if you can grab a gun and kill anyone else with you, you can then peer off the side of the building and take shots at anyone on ground level. Before you jump in, watch our video below for our top seven Blackout tips!